Thanks for all your prayers and support. We wanted to update everyone via web as we have so many people calling and asking about Aiden. As time permits, we will try to post an update on line every couple of days. For the last two nights, Aiden has held steady. This morning’s x-ray shows marginal improvement and he has a very long road ahead. 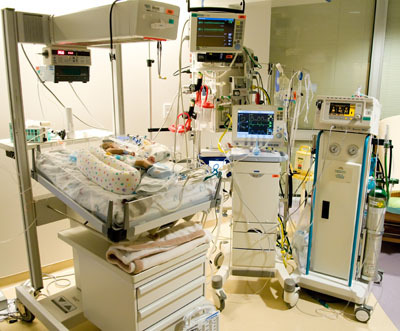 On Tuesday evening, Aiden was intubated because he was pulling too hard while breathing. Typically, this helps reduce the work his lungs have to do and gives him time to rest and heal. However, one of the risks is that the procedure can cause a pneumothorax (hole in the lung) and cause a medical emergency from accumulation of air or gas in the chest cavity. This air then causes the lung to collapse from the outside. Unfortunately, it happened during the procedure and the hole was large enough to where a chest tube had to be placed to remove the air outside the lung. With his chronic lung diseased and already weakened body, this is a serious thing and could cause deterioration beyond repair. In order to prevent him from moving or pulling out tubes, they sedated and paralyzed him with drugs. There was serious concern throughout Wednesday and we contacted many of our friends and family to pray for him. God worked and Aiden held his own on Wednesday and Thursday. 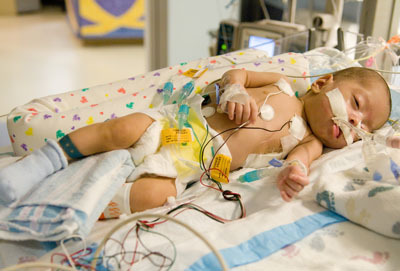 Thus far, they have been able to slowly reduce his oxygen needs. But he is still so fragile that anything can happen. It’s a very helpless feeling. Either one of use would trade places with him if we could. There is a very fine line when balancing the tradeoffs in trying to prevent his lungs from failing. Pray for wisdom for the doctors, nurses and technicians. Aiden has had many battles… this will be his greatest. Please continue to pray that his lungs would strengthen and that his body would heel.